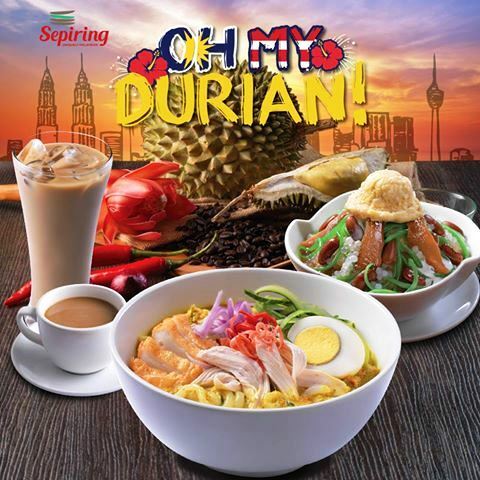 Those who loves durian, you might wanna sit tight as Sepiring has brought you several dishes that has DURIAN in them! Like this laksa above, the broth is made from fresh durian, which gives it a really distinct taste. On top, you'll get the standard pieces of chicken, fish cakes, sliced cucumbers, shallots, eggs, and a spoonful of durian plump to mix it all in. To be honest, it started out really weird but overtime, I just kept going for it. Not exactly the best laksa I've had, but certainly the most unique and one worth trying. For a limited time, I'd highly recommend trying it at least once, and don't be too frighten by the idea of it. Oh yes, durian coffee! In short, I loved it. The strong coffee flavour mixed with a hint of durian to give it that sweetness and aroma was delightful. 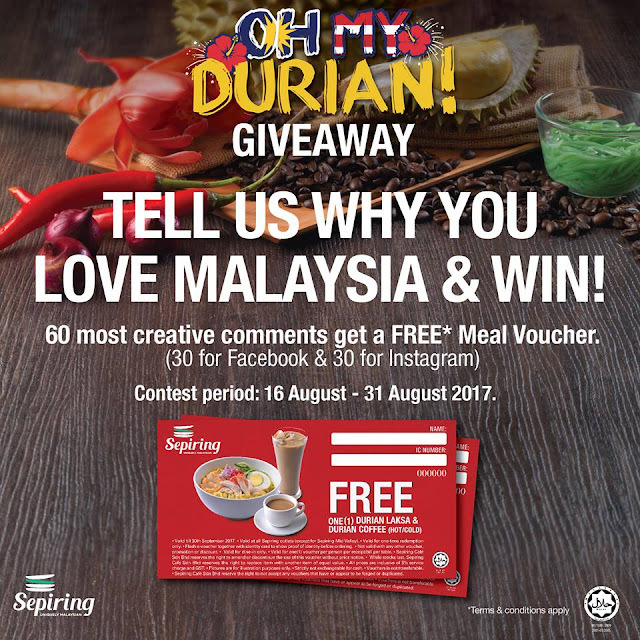 And of course, who could forget the Durian Cendol? Filled with a generous amount of kidney beans, cendol, dodol, sago and a large chunk of durian plump on top! Beautifully shaved ice with gula melaka and coconut milk - it's delicious! Last of the durian option - Durian Pancake. A thin sheet of light pancake skin filled with pure durian pulp and cream for a burst of flavour in your mouth. Definitely one of my top durian dessert favourites and highly recommended! I love Penang rojak. I like the spiciness, the nuttiness and the array of fruits & vegetables placed within one bowl. Sepiring's version of the Penang Rojak too is pretty good. With a generous amount of crushed peanuts, sauce and fruits, there's just no way I can say no to this. I have to say that I had my doubt. It's not easy to find a good bowl of asam laksa but I'll say that Sepiring's version definitely nailed it. The rich and spicy fish broth was packed with flavour that just coats each and every strand of noodle perfectly. The noodles were also nice and plump, which gives it a really nice bite! Generous serving of cute pineapple, shallots & cucumber helped elevate its texture and provided a nice crunch to the whole dish. This asam laksa may not be the best in Malaysia, but I'd say it's definitely the best in most restaurants! Personally, I'm not too much of a fan of Nasi Ulam. I dislike the fact that it's dry but I would say that the flavours here were adequate. I liked the Ayam Percik and the fragrant rice but overall, I'd still find it fairly dry. But I must say, the keropok lekor was awesome! Those who are interested could also join their contest and stand a chance to win FREE MEAL VOUCHER! Durian Laksa is one amazing place man. Look at the food they are serving all are super delicious and tempting too. Yummy, I can't wait to make a visit there.